One of my favourite Christian writers from former days is J. C. Ryle. Whether it is his sermons, books, tracts or short articles, he always seems to be so topical and up-to-date with his thoughts and observations. So-much-so that what came from his informative and challenging pen almost seems that it could well have been written yesterday. Imagine therefore my surprise and delight when a friend passed me a small news clipping he had come across dated 1861, and published in a local newspaper, the Derby Mercury. I was intrigued to discover that the same J. C. Ryle actually visited my home village of Crich in Derbyshire, in 1861. Sadly it wasn’t to speak at the small Baptist Church then located down Roes Lane, and which had only been built in 1839. Rather it was, predictably I suppose, to visit and address the gathered congregation of the Anglican church following some considerable ‘Restoration’ work there. J. C. Ryle does in fact have some quite local connections. His mother Susanna, was in fact born in Wirksworth, Derbyshire, only about 6 miles from Crich. Susanna came from a notable local family, the Hurts, and was the daughter of Charles Hurt. Susanna Hurt married J. C. Ryle’s father, also named John, in Wirksworth, on the 6th February 1811. Their son, John Charles Ryle, was born in Macclesfield, Cheshire, on the 10th May 1816. On his visit to speak at the Anglican church in Crich it appears that he also attended at the home of his mother’s relatives, Emma, Elizabeth and Selina Hurt, at Crich Chase. Their home was a substantial house located between Crich and Whatstandwell. RESTORATION OF THE CHURCH. 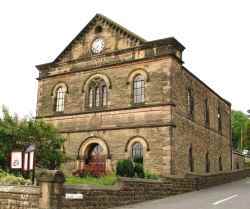 – Many of our readers are aware that the parish church of Crich has been restored, after designs by the famous architect Mr. Currie, of London. The restoration has been accomplished in the complete manner, and the result affords much gratification to all who have witnessed it. Whilst the exterior has been restored as to afford ample accommodation for rich and poor to worship God. The re-opening services took place on Wednesday last, when two sermons were preached by the Rev. J. C. Ryle, B.A., of Christ Church, Oxford, and rector of Helmingham, Suffolk. The sermon in the morning was an eloquent and impressive one, and was founded upon the 19th and 20th verses of the third chapter of the Acts of the Apostles. The church was completely filled by a congregation, including a large number of clergy, and the elite of the district. At the close of the service, a collection, amounting to the very liberal sum of £79 was made. A large number of ladies and gentlemen afterwards partook of a splendid luncheon, at the invitation of Misses Hurt, of Crich Cliff House, where a brilliant party assembled. The evening service was not so well attended. I do find the text from which J. C. Ryle preached those sermons in Crich to be most telling, and typical of the man. 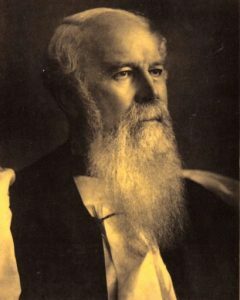 J. C. Ryle went on to become the first Anglican Bishop of Liverpool, where he was installed as such on the 10th April 1880. His term as Bishop lasted until 1st March 1900. He died, aged 84, in Lowestoft, Suffolk, on 10th June 1900. He is buried at All Saints Church, Childwall, Liverpool. The audio (mp3) of a talk given here at Crich Baptist Church by Dr. Nick Needham, pastor of the Reformed Baptist Church, Inverness, Scotland – Also Lecturer in Church History at The Highland Theological College. A small number of narrated sermons and historical biographies originally given by J C. Ryle, which were recorded at Crich Baptist Church.